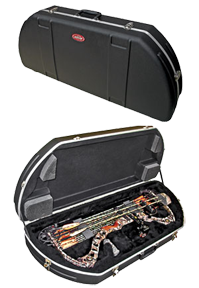 The 2SKB-4117 Hunter Series Bow Case is designed to accommodate most of the best selling bows on the market with the quiver attached at an affordable price point. Such as the Mathews Reezen, Mathews Monster, Mathews DXT, Mathews Drenalin, Mathews Outback, Bowtech Admiral, Bowtech Captain, Limbsaver DeadZone, Hoyt Alpha Max, Hoyt Power Hawk, Kodiak Outdoors Titan 34 Target, PSE X Force, plus many others. The new 2SKB-4117 Hunter Series Bow Case features a rigid shaped ABS shell with stylish embossing that actually adds structural support to the lid with an eight point interlocking stacking system. “SKB’s Perfect-Match” valance bending system provides a tight and secure fit to prevent dirt, dust and moisture from the interior of the case with lockable draw-bolt metal latches and a comfortable carrying handle and weighs eleven pounds. Features plush lined EPS inserts for maximum impact resistance and new state of the art water-jet cut polyethylene foam arrow system that will accommodate up to a dozen arrows. Includes 5 year Warranty.Interior Dimensions: 39" x 15" x 6"